The U.S. Congress passed an omnibus funding bill for the remainder of fiscal year (FY) 2015 that includes $1.1 trillion in total in discretionary federal funds, roughly half of which goes to federal civilian departments and agencies. Department of Energy funding of $27.9B supports programs across the department’s five primary mission areas: science, energy, environment, nuclear non-proliferation, and national security. National Nuclear Security Administration (NNSA): Funding for NNSA sees an increase of $200M over FY 2014 levels to maintain the safety, security, and readiness of the nation’s nuclear weapons stockpile. 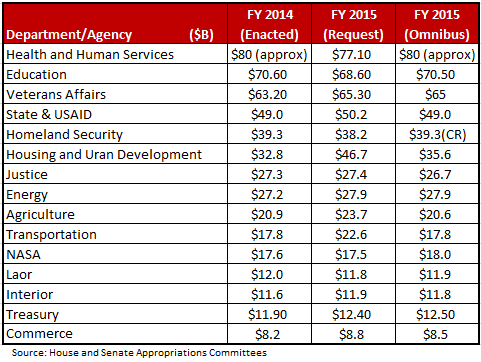 This increase brings NNSA’s funding to $11.4B for FY 2015. Funding includes $8.2B for weapons activities as well as $1.2B for naval reactors. Advanced simulation and computing efforts receive $598.0M, including $50.0M for activities related to the exascale initiative. Energy Programs: Support for programs that encourage U.S. competitiveness drive an increase of $22M over FY 2014 enacted levels, bringing funding for Energy Programs at DOE to $10.2B. Science Research: Funding for energy science research is maintained at FY 2014 levels, providing $5,071M to strengthen innovation and support basic energy research, development of high-performance computing systems, and exploration into next generation clean energy solutions. Advanced Research Projects Agency-Energy (ARPA-E): The advanced research organization ARPA-E receives $280.0M, $45M below the level requested for FY 2015. Department of Commerce funding of $8.5B marks an increase of $286M above the level enacted for FY 2014. Patent and Trademark Office (PTO): $3,458M for the U.S. Patents and Trademark Office, the full estimated amount of offsetting fee collection for FY 2015. The Patents and Trademark Office had nearly $651M in unobligated balances at the end of FY 2014. National Institute of Standards and Technology (NIST): $675.5M for the scientific and technical core programs at the National Institute of Standards and Technology (NIST). This amount includes $15M for the National Cybersecurity Center of Excellence and up to $60.7M for cybersecurity research and development. National Initiative for Cybersecurity Education receives $4M. These funds also provide $16.5M for the National Strategy for Trusted Identities in Cyberspace (NSTIC), which includes up to $6M for the lab-to-market program and up to $2M for urban dome programs. National Oceanic and Atmospheric Administration (NOAA): $5,441M for the National Oceanic and Atmospheric Administration (NOAA). This amount includes $3,333.4M for coastal, fisheries, marine, weather, satellite, and other programs. Census Bureau: $1,088M for the Bureau of the Census, which includes $840M for periodic censuses and programs. International Trade Administration: $472M in total program resources for the International Trade Administration. $10M of those funds are expected to be offset by fee collection, resulting in a direct appropriation of $462M. Of those funds, up to $9M ins for the Interagency Trade and Enforcement Center, up to $10M is for SelectUSA, and Global Markets are funded at levels at least equal to FY 2014. Go to Part 2 of Civilian Highlights, or check out our Defense Highlights of the FY 2015 Omnibus here.